I like the fact that if you’re not there they call you or email you to see if you’re OK. A lot of places you just show up and pay the fees and they don’t care what you do. The trainers (at PFP) like to check in and see how you’re doing. They say that the early bird gets the worm. Sarah Hopkins is certainly an early bird. 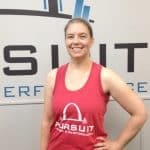 She may not be after any worms, but she is working towards good health, confidence and happiness, and those she’s found in spades since joining Pursuit Fitness and Performance (PFP) a year and a half ago. Sarah wakes up at 4:15 am each morning and on Monday, Wednesday and Friday, heads to the 5:00 am group training class at PFP. She fits her workout in before heading home to get her 7 year old son ready for school and then leaving for her own work day at Express Scripts. It’s not easy to work out so early each morning, especially before a long day, but for Sarah, it’s worth it. “I have a history of diabetes and heart disease running on both sides of my family, so once I hit 40 I realized I needed to do something,” Sarah says. “Mostly I was looking to do something for myself and to hold myself accountable.” Sarah saw an ad on Facebook for PFP’s 28 Day Transformation contest and decided to give it a try. She called PFP owner, Ryan Morgan, and elected to “make an appointment and ask questions later.” Sarah finished the 28 day challenge and was quickly hooked. She hasn’t looked back. FAVORITE HEALTHY RECIPE? Grilled chicken salad through the “Balanced Habits” program. It’s called “Better than Good Chicken Salad Wrap.” Also, anything with zoodles (zucchini noodles). I like Shrimp Scampi with zoodles and mozzarella balls. FAVORITE WORKOUT SONG? Anything with a good beat. I like ‘90s rap or pop. I also like a lot of hard rock or metal. GOALS FOR 2017? Decrease snacking at night and wine. Stay healthy and keep a good attitude about it. ADVICE FOR NEW MEMBERS? Do as many of the challenges as possible. It’s a great way to get more workouts and information, plus extra accountability and also to meet people who are going through the same journey that you are.